Madrid challenge: What to see in the city of architectural beauty with only 48 hours of time? Madrid surprised me totally. I have to say I didn’t know what to expect from the capital of Spain situated deep in the mainland that doesn’t pop up in the travelers stories very often. Madrid amazed me with its beauty, delicious food and diversity. Like many other major cities it is full of different suburbs with their own characteristics. What I also found wonderful was how much live music you hear all around Madrid! In all of the subway stations and parks there were always performers playing live music. 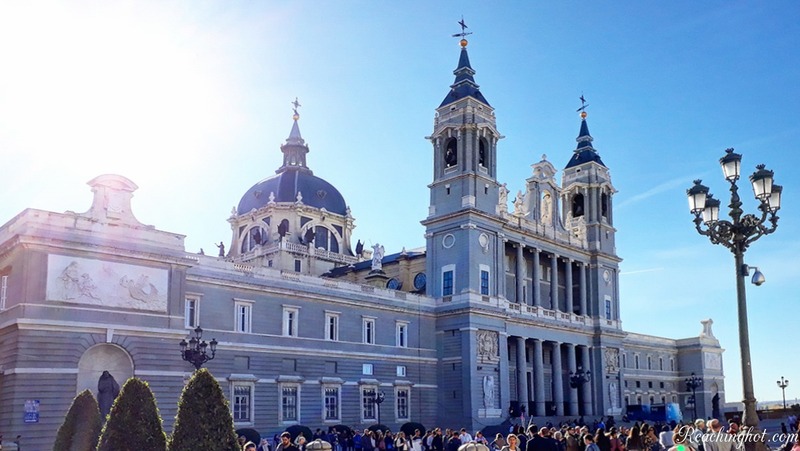 I will give you the ultimate guide on what to explore and eat during a short getaway in Madrid. I wanted to avoid filling my schedule with pre-planned program so that I would be free to go and experience the local life and also see some of the coolest places. There is beautiful architecture everywhere in Madrid! Or in other words Santa María la Real de la Almudena is a cathedral in the heart of Madrid. It is a beautiful cathedral both inside and outside. It also hosts an awesome viewpoint to the mountains but note that the viewpoint is accessible from the cathedral’s museum that is open only until 14:30 from Monday to Saturday! The museum is located on the right side of the cathedral, next to the King’s castle Palacio Real de Madrid. Palacio Real de Madrid or King’s Castle is one of the top sights of Madrid. It is a beautiful castle at any time of the day. There was a big queue to get in to the castle and I decided to save some time by not trying to get in. I have heard there is also a viewpoint to the same direction as from the Catedral de la Almudena. It is easy to combine the King’s Castle and Catedral de la Almudena since they are next to each other. The must-see Sunday market! For real it’s worth visiting! Save your souvenir shopping for this market that takes place every Sunday close to Retiro area. It’s several kilometers long and they sell everything from small items to clothes but not food. It’s one of the best places to get some real Madrid vibes! Chueca is the quirky rainbow neighbourhood featuring all kinds of people and an open atmosphere. I warmly recommend visiting the area, wandering around and grabbing a beer or two. I found a great night club there called TRUCO Chueca full of locals but with a really welcoming atmosphere and with great Spanish beats! So keep your mind open and visit Chueca! Plaza Mayor is THE place that you see in the photos of Madrid. It’s a beautiful main square that I also recommend checking out. For me it was enough to pass it a couple of times. It’s a place to see if you are visiting Madrid as a traveler! Madrid is such a lovely green city! El Paseo del Prado is a street where many of the attractions are located. There are museums, cathedrals, parks and fountains on the same road. Great place to explore! I was also fascinated by the parrot looking birds that have their nests on the trees along this street. They are so adorable! I think every city has to have one triumphal arch somewhere and so does Madrid. It’s a lovely arch positioned in the center of a roundabout called Puerta de Alcalá. Take first El Paseo del Prado road and then turn right to Calle de Alcalá and you will find the arch. In Paseo del Prado all the attractions are close to each other and I recommend checking them all out in one walk! Loving the weather and Madrid architecture! The main shopping area of Madrid is located in Gran Vía. All shopaholics – this is your place to go to! I had my accommodation close to the subway station Sol and on the streets of Gran Vía. It turned out to be a very good location to start travelling anywhere in the city. Parque de El Retiro is like the Central Park of Madrid. Beautiful park with many live musicians and artists around. There is a small lake in the park where you can hire a rowing boat. Locals love to go to that park during the weekend to chill, exercise and roller skate. Take my advice and go at least few subway stops away from the center looking for restaurants, cafes or bars. I recommend an area called Vallecas which is a local neighbourhood. In Vallecas I found good local restaurants offering delicious homefood with very reasonable price such as Camuy Espresso. In Vallecas I also ended up in a South American bar filled with happy Peruvians dancing to their music. Just take the metro to Puente de Vallecas and walk past the fast food restaurants to find local stores and eateries. In Madrid you can find a 3-course daily menu drinks included (note: BOTTLE of wine) for 10 euros. And yes, that’s the starter paella! #Callos – Interesting experience of tender pig stomach. Such a different taste at least for me, I recommend to try this traditional dish of Madrid! #Paella – The traditional Spanish dish with risotto, seafood and chicken = mouthwatering! #Octopus – Fried octopus in any kind of a dish is so delicious that it is a must try in Spain! #Morthia – If you are a friend of sausages this is your dish – Spanish black sausage! #Tortilla españa – Doesn’t have anything in common with the Mexican one. It’s an omelette with potatoes. Warm and comforting! #Verdejo – Wine to die for! The taste is fresh, really close to white wine and goes well with paella and seafood! Try at least once the menu of the day (menu del día)! I got a three course meal with drinks and not just any drinks but a whole wine bottle with only 10 euros. I took paella as the appetizer and for the main course I had a beefsteak which was perfectly cooked to medium. It was very juicy and tender! Spain is famous for its seafood and squid is my absolute favourite! Tip 1. Check the opening times! The Spanish opening times surprised me like that the museum of Catedral de la Almudena closes at 14:30. Tip 2. Don’t waste your time with the guys promoting their bars! They are most likely empty and the drinks are expensive. Tip 3. Get away from the centre to look for food! It’s cheaper, delicious and more local! Tip 4. Always look behind you! Not because of weirdos but because I happened to find amazing buildings when I remembered to turn around once in a while. Perfect weather for walking around the city! Bonus tip: Buy a travelcard for the entire stay. Zone A ticket is enough and you will get with the same ticket to the airport and back. I bought mine from the airport’s tourist office. The ticket cost 18 euros for 3 days. Looking for city breaks? Check out also my articles for Amsterdam and Helsinki!